Customizations can vary from custom fields, custom modules, code customizations, to 3rd party plug-ins. 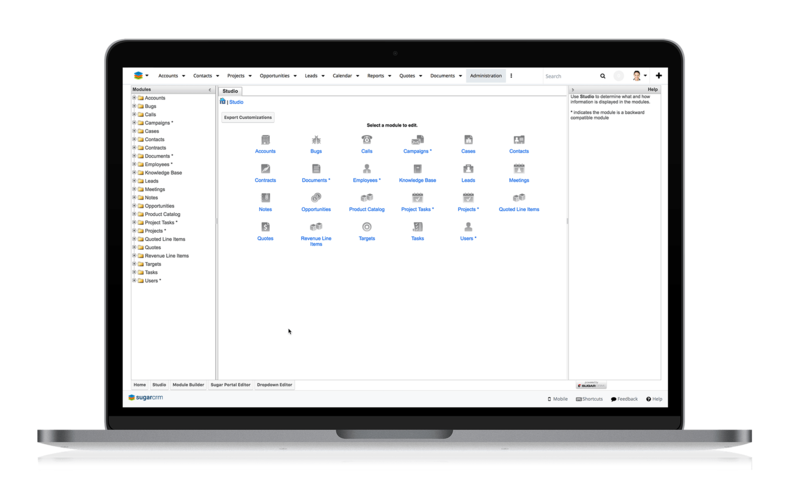 SugarCRM provides you with various tools to make Sugar your own. Create custom fields, layouts, relationships, and fields - all of these without writing a line of code. Use Sugar Studio to customize your Sugar instance as well as the Self-Service Portal. Sugar Administrators can also use Sugar Studio to easily customize SugarCRM Mobile app layouts. Use Sugar Module Builder to create custom modules to meet your business needs. Administrators and developers can use Module Builder to create, deploy, and export custom modules. Install custom file packages through Module Loader. Custom file packages can range from custom code to a 3rd plug-in party package. Manage or disable custom modules using Module Loader. Module Builder allows you to create Packages that house multiple modules of different types. Sugar Administrators can configure core Sugar functionality like module or sub-panel visibility, user access control, job schedulers and more. Administrators can also configure at a module level for specific functionality, for instance, track opportunities and build forecasts, to make them more relevant for their organizations.